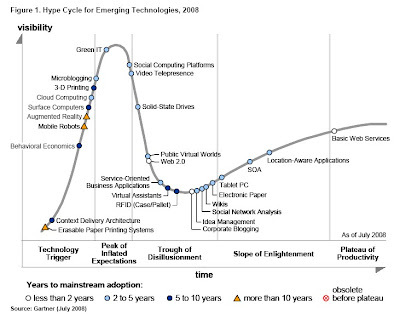 Gartner Hype Cycles are good for at least three things: identifying technologies that are still under the radar, taking a look back at stuff that was hyped up in the past but didn't go anywhere, and explaining to your parents what it is that you do as an emerging media strategist. Besides, they illustrate this wonderful quote from David Brooks's "Lord of the Meme" column in NYTimes: "In order to cement your status in the cultural elite, you want to be already sick of everything no one else has even heard of." 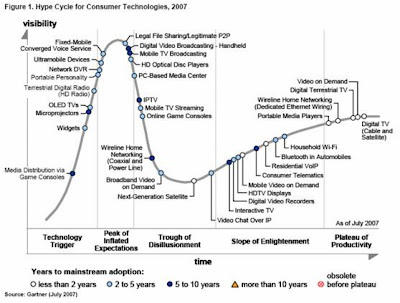 These graphs also provide good fodder for thinking about how media consumption would change if any of the pre-hype technologies reached mass adoption. 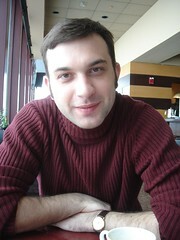 After catching the 2008 graph on Techcrunch a few days ago, I hit up Google image search for earlier versions. (You can also buy Gartner's original reports, but at close to $2,000 apiece they are beyond this blog's budget). Below is what I've found. 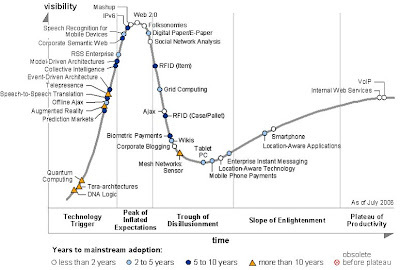 You will see that some of the technologies don't make it into the later versions of the graph; I think it's because these are Garther's charts for different tech sectors. Click on images to zoom in. If you have graphs for the missing years, please comment or drop me a line. 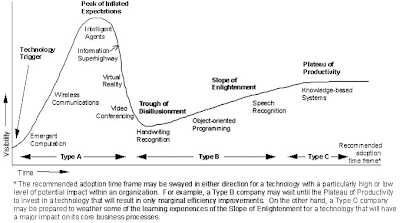 We are very pleased you find the Hype cycle so useful. Thanks for writing about it. 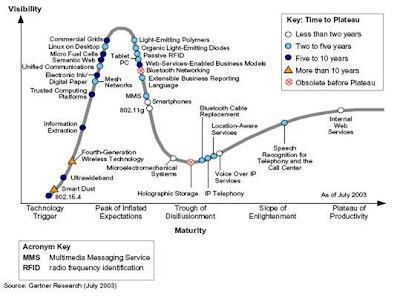 Your supposition is correct - over the years since the first Hype Cycle (the 1995 one you show here) we have had to 'fork' it many times. We now publish about 60 annually, covering over 1000 technologies, innovations and management concepts. Sometimes things just fail - never reaching the plateau of productivity. Also - once they reach that stage, after a while we remove them from view. On other occasions things change name - or split into parts as they move through the cycle. 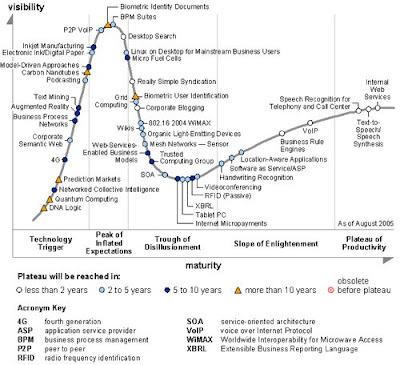 A good example is the 'Application Service Provider' (ASP) term circa 2002 - nowadays called 'Software as a Service (Saas). Thank you for leaving a note, Mark. Is Google More Expensive Than TV? Trivia: Who Invented Bumper Sticker? Electronic Ink Publishing Almost Here?